Brand new in box, but hat is missing. Please note the doll you will receive has only been taken out of the box to be signed and is in mint condition. 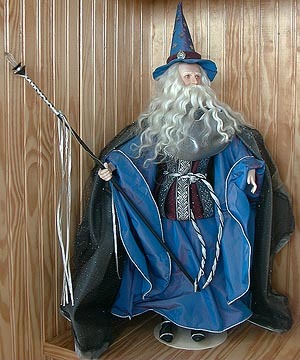 From the pages of JRR Tolkien as envisioned by Greg Hildebrandt comes Gandalf the Wizard. Produced by the Franklin Mint this lavish doll comes with life like hair, a wizards staff, a wizards hat, and a beautiful cloak that will take you straight to the world of JRR Tolkien and The Lord of the Rings. Gandalf is nearly 21" tall.